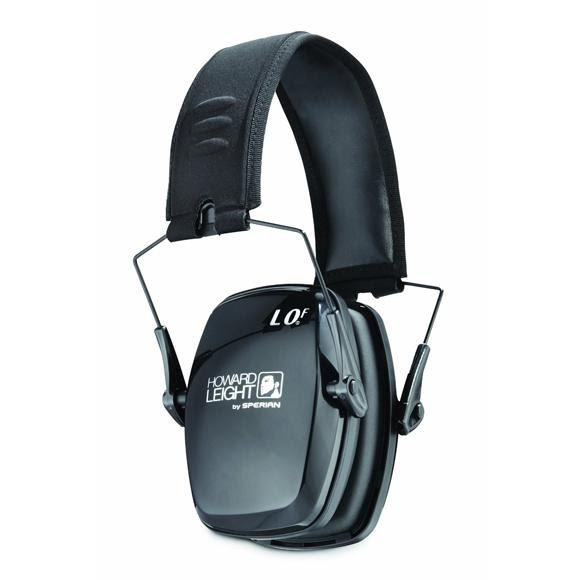 Get the ultimate ear muff from Howard Leight's NRR 23 Folding Ear Muffs. This NRR 23 ear muff provides protection from damaging noise levels while delivering to users an unprecedented degree of comfort. The earmuffs use Air Flow Control technology that dictates how sound reaches the ear, producing excellent dB reduction with a slimmer overall profile than competing earmuff designs. Get the ultimate ear muff from Howard Leight &apos;s NRR 23 Folding Ear Muffs. This NRR 23 ear muff provides protection from damaging noise levels while delivering to users an unprecedented degree of comfort. The earmuffs use Air Flow Control technology that dictates how sound reaches the ear, producing excellent dB reduction with a slimmer overall profile than competing earmuff designs. Sleek, ultraslim earcup design won&apos;t interfere with the firearm stock. Ultra lightweight at only 40 ounces. Padded headband and super soft ear cushions deliver all-day comfort. Black headband with black earcups.